Growing up in Worcester, Anthony Lopopolo loved reading about world events in Barron’s and The Wall Street Journal. While this prompted a lifetime interest in finance, a co-op experience in college led him first to industrial engineering and logistics for UPS. After seven years, he was ready for a change. Drawn to numbers and with an analytical mindset, he found his passion in investments and financial planning. 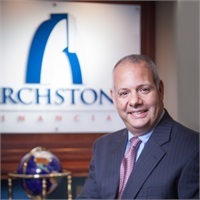 A co-founder of Archstone Financial, Anthony welcomes the firm’s planning focus. He finds meaning in helping individuals to establish and attain financial goals; from sending one's children to college to establishing financial independence or just a comfortable retirement. He believes in client communication to simplify what can be a complex financial world. Sticking to facts, avoiding what he calls headline noise, he helps clients despite the vagaries of the markets. He works closely with small business owners establishing employee retirement plans, executive deferred compensation plans and trusts, and the particular challenges for single women investors. Outside the office, Anthony enjoys time with his wife and five daughters, with an ideal day spent fishing off Cape Cod.